2. Remember they are always searching. 4. Keep your head down. 5. Don't fall in love. Five simple rules. Ariane Tucker has followed them since the night she escaped from the genetics lab where she was created, the result of combining human and extraterrestrial DNA. Ariane's survival--and that of her adoptive father--depends on her ability to blend in among the full-blooded humans, to hide in plain sight from those who seek to recover their lost (and expensive) "project." But when a cruel prank at school goes awry, it puts her in the path of Zane Bradshaw, the police chief's son and someone who sees too much. Someone who really sees her. After years of trying to be invisible, Ariane finds the attention frightening--and utterly intoxicating. Suddenly, nothing is simple anymore, especially not the rules. You grab this thinking it's some sort of dystopian/sci-fi thriller YA novel. And, yes, there's some of that in there. Instead of being strictly that, The Rules is also some romance, some high school clique-drama, and some rather bizarre and intense situations all rolled into one story. Really, it's well done. And it's not like Kade's other books--which come off a little silly to me. Ariane is in a typical teenage state--finding herself. But also, finding out the truth of what happened to her when she was younger. She's a great character, and one I enjoyed getting to know, and pulling for. She's sharp, without being too much so, and still vulnerable, like all teenage girls are at the core. Zane is the great guy next door, who has his own skeletons in the closet. Again, really that good, good, guy that any father would love to see his daughter with. But the relationship is organic, and not forced or fast (like so many YA romances are). Great story line, never slows down. Every time a twist pulled up, I really had no idea it was coming. It kept me on my toes, and was a "finish in a sitting" book. 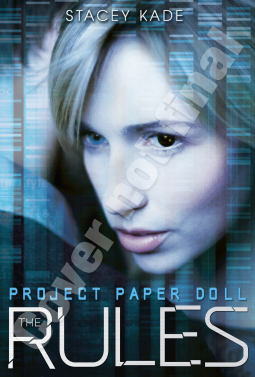 It is the first in a series (Project Paper Dolls), but it's one that could stand alone and leave you satisfied. Sadly, the next book is over a year away...perhaps someone could suggest that Stacey Kade hurry up, a bit? Disclosure of Material Connection: I received this ebook galley from Disney Book Group through the netGalley publisher/reader connection program. I was not required to write a positive review. The opinions I have expressed are my own.